Male Conservatives must rethink their attitudes and behaviour to women or be "left behind", a Tory MP has said. Writing in the House magazine, Bernard Jenkin said many Tory men feel "women's issues" should be left to women "so men can get on with running the country". The lack of women in the upper reaches of government and the party was proof of the culture change needed, he added. "We have perhaps yet to understand what change in the Conservative Party really means," he claimed. Monday's coalition reshuffle was seen as an attempt to boost the proportion of female ministers in government and to promote more women to senior positions. Among those to get promotions were Esther McVey, Jane Ellison and Nicky Morgan. Anna Soubry broke new ground by becoming the first ever female defence minister - after complaining that she had been given her previous role as public health minister because David Cameron thought only a woman could do a "soft bloody girly" job. 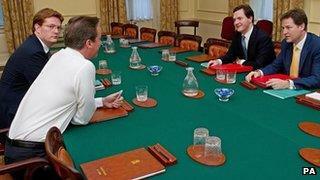 Mr Cameron has said he wants a third of ministers to be women by the end of the Parliament 2015. But of the 32 ministers entitled to attend Cabinet, currently only five are women. Image caption How much has changed since Bernard Jenkin (eighth from right) was on the Tory front bench in 2001? Opinion polls have suggested the government's popularity among female voters has fallen sharply since 2010 although a recent Ipsos-Mori survey suggested the three main party leaders could all do more to address women's concerns. Mr Cameron has come under fire from Labour critics in the past for allegedly sexist attitudes towards female MPs, particularly after he told shadow minister Angela Eagle to "calm down, dear," during prime minister's questions. But the prime minister has always rejected claims he and his party have a problem with attracting women voters. Labour has used all-women shortlists to boost its number of female MPs and leader Ed Miliband has said his aim is to have a shadow cabinet that is 50% woman. The Conservatives have always resisted all-women shortlists, arguing that they unfair and patronising - and that women should be promoted on merit rather than gender. The Lib Dems, who have the smallest percentage of female MPs among the three main parties, just seven out of 57 MPs, are understood to be considering all-women shortlists. But Mr Jenkin suggested the problem lay at the top of government, such as the all-male "quad" of David Cameron, George Osborne, Nick Clegg and Danny Alexander, who make the key coalition decisions. And it was a question of ingrained attitudes within the Conservative Party. "Many of us Tory men tend to feel that 'women' can deal with 'women's issues', so men can get on with running the country. "The Quad are all men. The National Security Council is overwhelmingly men. The Tory high command (David Cameron, George Osborne and Lynton Crosby) are all men. "Only three out of 25 on the Party Board are women. Most of the advisers and policy wonks are men. "And of course, most MPs will continue to be men. It is going to take a long time to change all this, so what else must we change? We should look at how we all behave." An MP since 1992, Mr Jenkin was once in charge of efforts to make the Conservative parliamentary party more diverse, by getting more female and ethnic minority candidates elected. He now chairs the public administration select committee. All men were guilty of "unconscious slights to women", Mr Jenkin added, but women voters "see it and feel it" when senior politicians do it. "A business change programme would involve zero tolerance of such behaviour. We have perhaps yet to understand what "change" in the Conservative Party really means." "It is not something the leadership does, or women can do for us. Every man in the Conservative Party needs to change or be left behind. The leadership needs to be on this 24-7-365, not just at reshuffle time." Labour said the Conservatives were simply "out of touch" with the challenges facing women in the current financial climate. "It is a problem which goes right up to David Cameron and has seen women disproportionately affected by his government's cost of living crisis," said shadow equalities minister Gloria De Piero. "While nearly half of Labour's shadow cabinet are women, David Cameron has only four women in his top team of 22. That says it all." However, former home secretary Jacqui Smith recently criticised the absence of a woman in Labour's 2015 general election planning team.